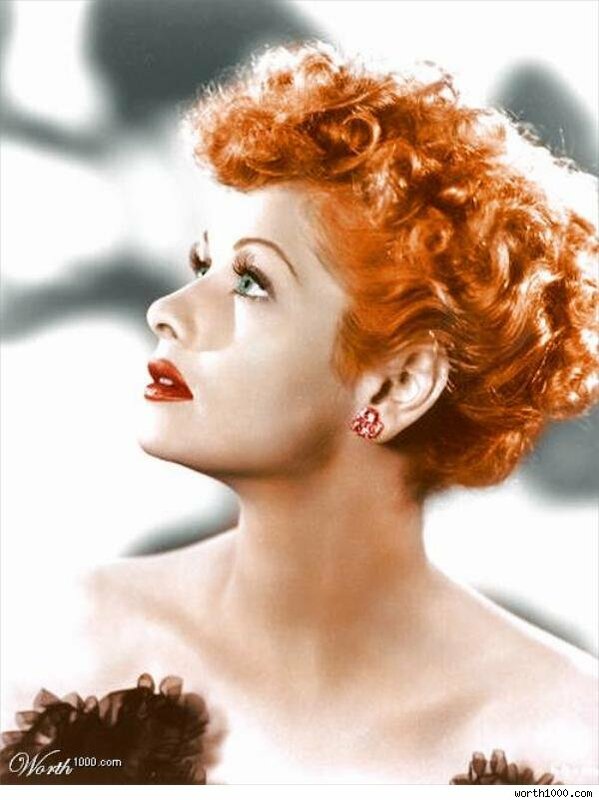 Lucille Ball is such an icon of television that we forget that she had a career long before I Love Lucy. 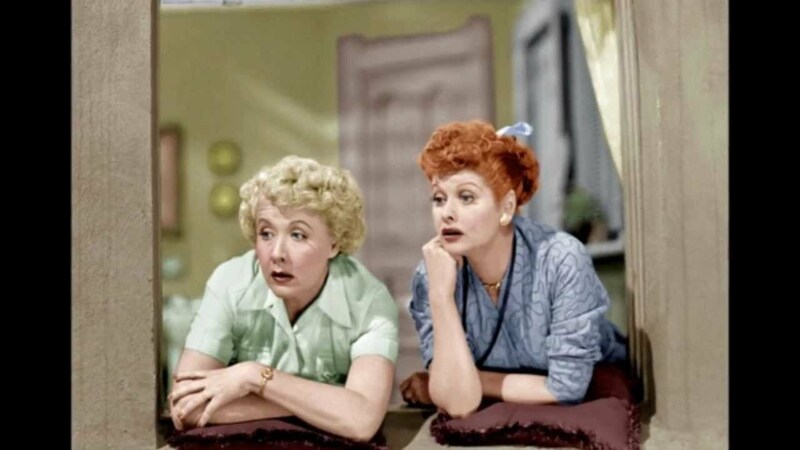 Today, on what would have been her One Hundredth Birthday, I pause to look beyond Lucy Ricardo, or Lucy Carmichael, or Lucy Carter, to see Lucille Ball, Queen of the B-Pictures. I am going to take a guess that she wouldn't like having that title applied to her. However, I also think she was eternally grateful to be a working actress, and that's really what Ball was: a working actress: no job too big or small. She could play anything: drama (The Big Street), musical (DuBarry Was A Lady, more on Mame later), and of course, comedy (Miss Grant Takes Richmond). That may have been the problem. Her studios (she jumped around from RKO to MGM) simply didn't know what to do with her. It was obvious she had talent, but the group of female comedy stars was rather limited: either in the Fanny Brice style (a bit of a dunce) or the Mae West type (a sharp-tongued seductress). Ball's style was more physical, with the fact that she was beautiful making things more funny. However, as I heard in the documentary Finding Lucy, funny women didn't sell tickets; beautiful women did. Therefore, she bounded around Hollywood, gaining some fame but never the breakout role she yearned for. As a side note, she had at least two chances to be in a BIG movie. The first was when Cecil B. DeMille offered Ball a role in his massive circus epic The Greatest Show on Earth, but she had to pull out because of her pregnancy. The second was when she was seriously considered for the role of Mrs. Iselin in The Manchurian Candidate (eventually played by Angela Lansbury). I personally think Lucille Ball would have been sensational as the monstrous Mrs. Iselin, given her career a turn that would have shocked everyone at just how good an actress she was. Well, all speculation. Yet I digress. As she went on in her career, I go back to some of the films I can recall. Take the first film she made with the love of her life, Desi Arnaz. Whether it was an omen or not we don't know, but somehow the title Too Many Girls seemed more like the title to Arnaz's autobiography. It's a delightful musical romp, with Ball's singing surprisingly good. I cannot say for certain if it was dubbed (I found nothing as of yet to prove or disprove that Ball did her own singing in the film). However, the end product shows that she could do musicals. Now I get on to Mame. I remember seeing it once, and I would say that her voice was a bit deep for the Jerry Herman songs. There were problems with the film (and yes, I think Ball was too old to believable play the part of Mame Dennis), but to single her out for the failure of Mame is unfair. Now, it has been a while since I've seen it, so perhaps my memories of it are different than the actual film itself. Still, Mame was not all Lucille Ball's fault. Even if the producers had realized she didn't have a good singing voice, why hire her in the first place? Yes, there would be publicity, but ultimately it would have been the wrong kind. A bigger factor was her age: even she should have realized that at age 63 she could not play a woman in her thirties/forties. I think that her best work was for television, not just in television, but for television. She became the first woman to head her own television production and the first to head a studio (Desilu--the company she and Arnaz formed to produce I Love Lucy). Also, if it weren't for Lucille Ball we might not have a Comic-Con, an Oscar for Sean Connery. or a Tom Cruise franchise. It was her studio, Desilu, that produced The Untouchables, Mission: Impossible, and Star Trek. She was the one that gave these shows the OK, and it shows her to have been a shrewd businesswoman. Moreover, both she and Arnaz created syndication. They did not want to record I Love Lucy in New York but in Los Angeles, and they didn't want it on kinescope but on film. In exchange for a pay cut, CBS gave them the rights to the show after the first broadcasts. In typical Hollywood lack-of-foresight, CBS did not think anyone would want to see a show twice. Thanks to their thinking, we have I Love Lucy preserved when so many other early television programs are lost, and we also have the extremely lucrative home video market. Without Lucille Ball and Desi Arnaz, audiences today would not be able to enjoy programs both old and new: it's worth considering that the sci-fi show Firefly did not become popular until afterit went to DVD, so in a sense, Nathan Fillion should thank Lucy for his career and her legacy. And what a legacy she left. Even today, I Love Lucy is being watched. It isn't because it's old. It isn't because it's required. It's because it is just funny. Moving beyond the iconic scenes (Job Switching's famous chocolate assembly line, Lucy getting hopelessly drunk on Lucy Does A Commercial, L.A. At Last! 's hilarious William Holden scenes) what I Love Lucy has at its heart is the story of four people who care about each other, in situations that are familiar to us (the need for more income, a desire for fame or at least public recognition) though they were always exaggerated. I still find I Love Lucy hilarious because the situations have a logic to them but they are at times so bizarre that it's impossible not to laugh. One episode I remember is Lucy Learns to Drive. It it, the Ricardos get a new car to drive to California and decide to return an old jalopy Fred Mertz got them. In Lucy's eagerness to teach Ethel to drive, the girls hit the back of the jalopy. Deciding to get it fixed before the boys find out, Lucy takes it to the dealership...only to return with the jalopy now in the back of the new car! Even before we got that twist (which did have a logic to it, an odd logic but logic nonetheless), I was on the floor laughing. Those kinds of laughs are hard to come by nowadays, simply because a lot of present-day comedy appears to be innuendo-driven (case in point, Two and A Half Men). Still, I'm willing to bet people will be watching I Love Lucy more than Two and A Half Men or That 70's Show. This isn't to say modern comedies should be dismissed (case in point, The Office), but I Love Lucy is still the standard that all situation comedies are measured by. 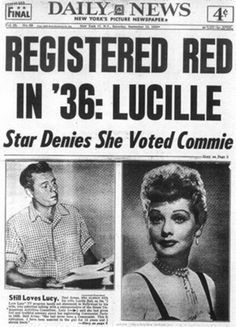 One thing that should be remembered about Lucille Ball is that she, unlike so many other Hollywood stars, survived the blacklist during the "Red Scare" of the 1950's. Ball admitted that she had registered as a Communist in the 1930's, and any other star making such an admission would have had their career sunk. People were fired or forced out of work for lesser things. However, her confession came with a caveat: she had registered as such only to humor her socialist grandfather. No solid evidence has ever been found to support the idea that she was a "fellow traveler". I don't think she was really even interested in politics, let alone such left-wing politics as Communism. I can't say that she helped usher the end of the witch-hunt, but she did prove that even with documented proof of Communist registration, you could still survive. I think it had to do with the fact that her sponsor Phillip Morris, one of the only times I am thankful to a cigarette company, backed Ball and Arnaz fully (money will always trump comradeship), and that the "Lucy" character was just so beloved the idea that Lucille Ball was a threat to America was downright laughable. The fact that Arnaz was himself a victim of Communism, forced to leave his native Cuba because of it, no doubt helped. 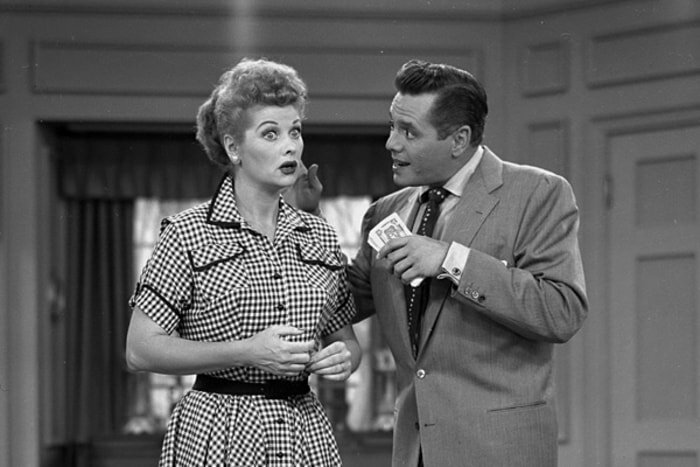 As he later quipped, 'The only thing Red about Lucy was her hair...and even that was fake!" This isn't to belittle or diminish the fear that the Red Scare created. However, if it were not for the popularity of the show and the public's love for Ball (if, say, she had remained on radio), her career might never have recovered. A great deal of television history turned on her survival of this 'scandal'. In the long run, Lucille Ball will be remembered for her television work, as well she should be remembered for it. However, I think that her films pre-I Love Lucy have great moments of acting and comedy (The Long, Long, Trailer, while good and charming, at times does appear to be I Love Lucy on the big screen, and I found Forever, Darling to be a bit dull, even creepy with James Mason floating about). After I Love Lucy, her films did well, but for better or worse, the shadow of Lucy Ricardo filled the screen. Finally, after the disastrous reception Mame got, she was scared off films forever. Her final effort to revive the "Lucy" character, Life With Lucy, was also rejected, a total flop with critics and audiences. It was a sad and sorry end to an extraordinary legacy. I think this made her more reclusive, but life or Fate (however she or you define it) allowed her one last moment of glory. When she presented with Bob Hope at the 61st Annual Academy Awards, both received a rapturous standing ovation. Ball even managed to show off a daring amount of leg for a woman her age, and more remarkably, managed to get away with it. It seems fitting that Ball at least had the opportunity to see that the public will always love Lucy, no matter how often she finds herself in disasters (including the 61st Annual Academy Awards, which started with the infamous "Snow White" musical number, perhaps one of the lowest moments in Oscar history). Still, why would we measure Lucille Ball's success or failure based on one show? Instead, we should focus on the fact that she wouldn't rest on her laurels, that she continuously pushed herself as a performer (even when the results like Mame or Life With Lucy failed spectacularly). The fact that she tried something new as she grew older, to my mind, is a positive. 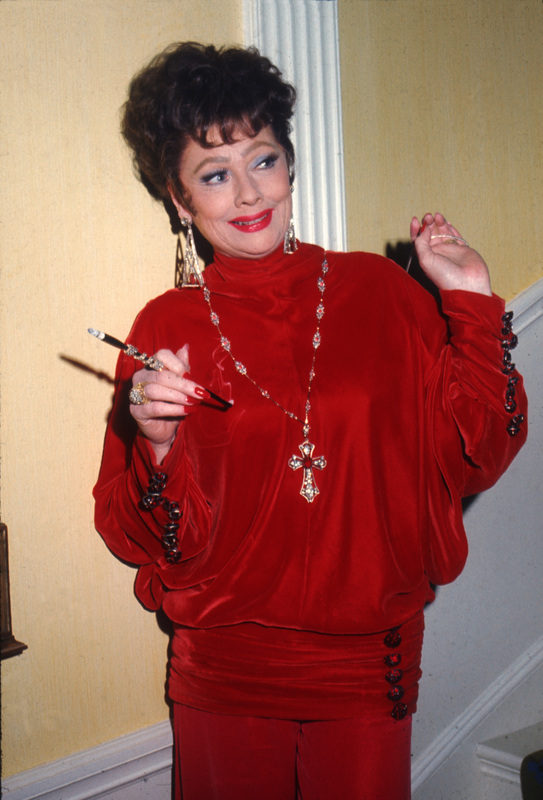 All Lucille Ball wanted to be was an actress. What she ended up becoming was an icon.